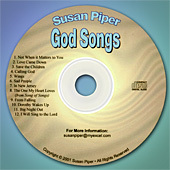 These are my first Christian songs. Thinking about it now, three and a half years into the journey (not too long, eh?) I can’t believe I haven’t always been writing about God. My first year of being with Jesus, before my baptism, He took my drinking away, gave me my first moral awareness regarding ‘relationships’ (convicted me of sin and made me want to please Him) and came into my songwriting. I really made a conscious decision to become a Christian songwriter… (at least I thought I did! )–and I was very timid about it then, afraid to tell people about the change in me, for fear of what they would think. It really didn’t take too long for that to go away! I surprised a few people who had invited the ‘former’ me to come and sing–one woman said she “wouldn’t have me back next year… there was just too much God”… and so I made it through the transition. The first song is about my friend Mary who lost a baby… ‘Wings’ describes my friend Martha who is featured on the album God Is… ‘Dorothy Wakes Up’ is me, the new Christian, going before the record company with the gospel (just as she went before the great and powerful Wizard of Oz) and feeling very small and meek…’From Falling’ is losing all the secular music connections… and ‘In New Jersey’ is my testimony song, since I had to move here to meet Him!